Weddings What’s Your Wedding Concept? You’ve set the wedding date, and asked your best friends to be part of your bridal party. So what’s your wedding concept? With so many real-life inspirations and a wealth of ideas from Pinterest, deciding on your concept can be one of the hardest decisions to make, but also the most important—after all, it will influence your venue, decor, vendors, dress code, and even your wedding dress. Once you determine your concept, all the other elements of your wedding will effortlessly fall into place. However if you'd rather leave it in an expert's good hands, Sofitel Singapore City Centre offers couples four different concepts—fairytale, modern and cosmopolitan, garden and vintage, and extraordinary—that come complete with unique table settings, stationery design, menus and more. Still can't decide which concept to go with for your wedding? Here are our recommendations based on your personality. If you have always dreamed of a grand ballroom wedding right out of a romance novel, you’ll appreciate the whimsical theme of the Fairy Tale concept. Imagine the grand Wallich Ballroom awash in pastel shades, adorned in cascading blossoms and illuminated in the glow of candlelight—sounds like your perfect wedding? Tatler Tip: Known for her romantic and otherworldly lace gowns, Claire Pettibone's feminine designs are perfect for making your fairytale wedding dreams come true. Less is more for you, and this extends to your wedding as well. Enough with the frills—clean and sleek is the ideal approach. Of course, that doesn’t mean you will settle for anything less than an elegant wedding. The Modern and Cosmopolitan concept transforms Sofitel Singapore City Centre’s ballroom with a minimalist colour palette and timeless design. Tatler Tip: Thanks to her exceptional personal style, Carolina Herrera has counted various First Ladies amongst her clientele, including Michelle Obama and Melania Trump. The same contemporary sensibilities are applied to her bridal collection, where you'll find sleek and chic silhouettes, perfect for the modern power woman of today. If you are partial to vintage prints, earth-toned colours and quaint trinkets inspired by nature, then the Garden and Vintage concept is right up your alley. The ballroom will be morphed into an indoor garden of lush foliage, delicate baby’s breath, and accents of oakwood for your ceremony, so you and your guests can enjoy the beauty of a garden wedding, without dealing with the unpredictability and discomforts of an outdoor wedding. Tatler Tip: Ivory lace, floral appliques and layers of silk tulle look right at home in a vintage garden. Galia Lahav's delicate designs and flowing silhouette will add a touch of ethereality to your garden wedding. If you have a flair for the dramatic, the Extraordinary theme sets the stage for you. After all, you'll only have one wedding so you definitely want it to make an impression that lasts. The magnificent Wallich Ballroom will be dressed in shades of gold and silver, and glimmering with crystals and diamantes, ensuring a wedding that your guests will never forget. Tatler Tip: A bride who wears Zuhair Murad is one who knows how to make an entrance. The Lebanese couturier's beaded, glittering dresses will ensure that all eyes are on you as you glide down the aisle. Of course, no two brides are alike, so even if you pick one of the concepts above, you can still customise it to your personal tastes. 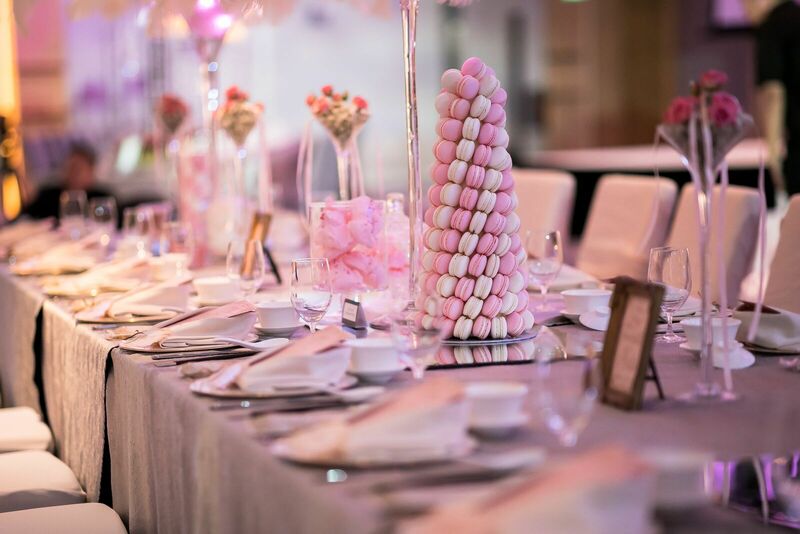 From flower arrangements to catering—provided by Imperial Treasure—you can work with a personal wedding butler to ensure that every detail of your big night at Sofitel Singapore City Centre is what you dreamed that your wedding will be.